bzimport set Reference to bz63512. I don't think it's the browser, both images are running 33.0.1750.154 m.
I am pretty sure this issue is being caused by Liberation Sans. Is it the case you have it installed Martin? Windows 7 does have Arial Regular. So the type might be defaulting to Arial Narrow. If you have Open Office installed, Open Office carries the Liberation font stack. So the font may be defaulting to Liberation Sans in some cases. If you install Arimo - the first open source font specified in the font stack, you may see other issues such a fat F's, I's. case you have it installed Martin? No, unless it's under a different name, I don't see it listed. stack, you may see other issues such a fat F's, I's. This is a screenshot with ClearType on, it's using Arimo, but when I turn it off it goes back to Helvetica. Thank you all for not making me turn on ClearType. Please don't hate me for not using it. Thanks very much for the assistance Martin. See 63591 for a more detailed bug report. So, what is the way forward here? Killing off Liberation Sans and Arimo? Is somebody working on this? It appears that en.wikipedia.org already have done that. Now they provide font-family: "Helvetica Neue",Helvetica,Arial,sans-serif. In my case it results in Arial on Windows 7 (instead Liberation Sans, see bug 63591) and Nimbus Sans L on Ubuntu 12.04 (instead Liberation Sans too). In my opinion it looks better now on both systems. we need to reevaluate these two fonts at least in the Windows context. I dropped them on enwiki as we'd had many reports that the font rendering was just broken and I was able to confirm there were problems with both Arimo and Liberation Sans and thus unreadable thus going against the whole ides of providing free knowledge. Easiest thing seems to be to drop them. Is there anything else we could do to keep our free font commitment? I'm kind of concerned that an issue was fixed *only* on enwikipedia. 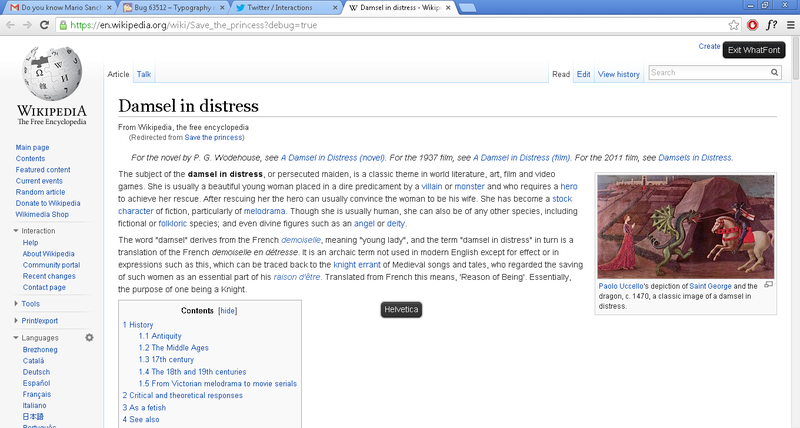 Issues that affect all wikis on cluster really should not be fixed on just a single wiki. You are correct Brian, this is very insufficient and it is a concern to me. I will mail a long email with details and possible next steps to address the long term issue of finding a free font we can support sometime Monday. What this space. Brian: we definitely won't consider this bug resolved until we've fixed the problem on all Wikimedia wikis by properly changing core's Vector LESS styles. We tested and implemented local fixes on Beta Labs and English Wikipedia since it was a Friday and we wanted to get user feedback quickly via the Village Pumps etc. Jon will be putting a real patch in place and we have coordinated with the [[wikitech:SWAT deploys]] team to shoot for Monday. Bartosz: yes, for now removing Arimo and Liberation Sans is fixing the problem for XP and Windows 7 users. In the future we need to take a second look at see if there is any freely-licensed font that will render well for users without subpixel rendering. For now, this fix is what users are saying improves things. Free fonts render bad on Windows (at least without font smoothing). Even though font smooting has been the default since Vista, I was suprised to see how many people have it disabled (for whatever reason). I don't know how many exactly, but the response suggests it is not a negligable part of our readers. Only fonts made by/for Microsoft have been hinted for screens without font smoothing or ClearType. Other FOSS fonts are hinted but only for scenarios with font smoothing enabled, not for 'grid display' (pixel diplay hinting). But not only free font are a problem; There are very bad copies of Helvetica floating around (HP printer drivers for example) that display atrocious with or without smooting. That means carrying Helvitica in the font stack also carries the risk of bad display. Only Latin script is targeted. That means only languages based on Latin, and perhaps Cyrillic, could benefit from the typography refresh. Other scripts, most notably, Hebrew, CJK, Hindi, Arabic and all other non-Latin based scripts that usually depend on ohter fonts such as David, Batang and MS Gothic on Windows for proper display, have *never* been considered. This is perhaps the largest oversight of all. In conclusion, it is impossible to target *all* platforms *and* scripts in one single font stack. And I believe we should no longer try. There is not going to be a 'solution'; we are not a "single language" website, where typography has much more freedon because it only has to deal with one script or language. I am now convinced that a single font stack for a website, or more specifically, the software running that website, that has to deal with the *most* languages and scripts then *any* other website, is simply not possible. Each project should have the freedom of choice to decide on their own font stacks to suit their needs as best they can. 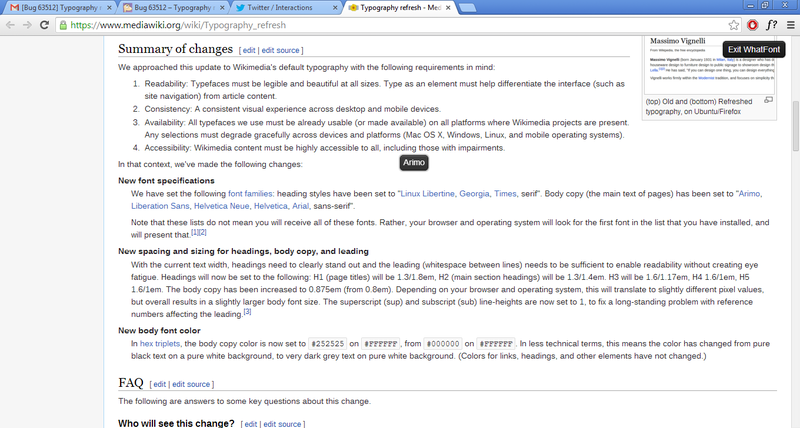 From the point of view from MediaWiki, that means it should not force any specific font at all. Has this been for nothing? I don't think so, because we could learn a lot from this and perhaps work on other solutions to help each project with their typography. 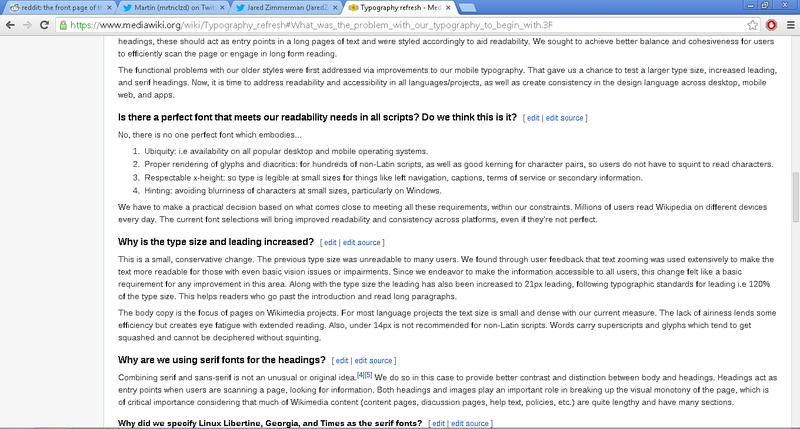 But in its own right, the "Typograhy refresh" has failed as an practical solution. I was not enthausiastic in the beginning, but was willing to give it a try. I think it's exaggerating to say that, considering most Windows users do not in fact have Liberation Sans nor Arimo. For the Windows users without font smoothing turned on, Arial should work just fine. We plan on having a public retrospective in two weeks (see also: [[en:Retrospective#Software development]]) where we can talk about the process and results of the beta and first release. Your comments will be most welcome there Erwin, since you've definitely been in the thick of responding to questions/comments as much as anyone. in fact have Liberation Sans nor Arimo. Liberation Sans is installed by default with LibreOffice, and the popularity of free office suites have grown in the recent years among Windows users too . This is likely a non-negligible number of users. I think this is a very good point that should be seriously considered. > in fact have Liberation Sans nor Arimo.
. This is likely a non-negligible number of users. I certainly didn't say it's a negligible amount. I said "most". We obviously think it's enough to require removal of the two fonts. I certainly didn't say it's a negligible amount. I said "most". Right, it's probably not over 50%. Sorry to hijack this, but given the very issue was discussed a month and a half ago ( http://lists.wikimedia.org/pipermail/wikitech-l/2014-February/074478.html ), how did that end up being an oversight? how did that end up being an oversight? Because it was quite deliberately ignored. Reading up on past discussion, I also found , where TheDJ was echoing my exact thoughts as I do now. Mobile is also not comparable to desktop systems, as mobile fonts are usually very limited and easily overridden by the devices for non-latin scripts. 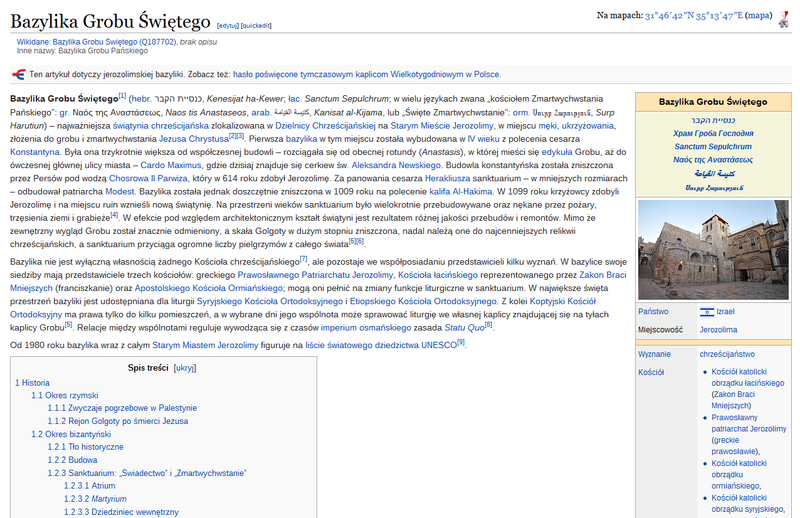 Steven's response was that Wikipedia needed to be more inline with other world class sites with their flashy typography. But he does not realize that sites like Microsoft, Yahoo and Google/Gmail have well-funded local web staffs and an infrastructure that *does* serve specific- and well-researched font stacks based on the user's language, and potentially OS; something that Wikipedia's current indrastructure is incapable of doing. So I will stress again that this should be classified as an per-project issue, not a global one; One universal font stack for the entire world is an illusion. > how did that end up being an oversight? also found , where TheDJ was echoing my exact thoughts as I do now. I'm sorry, but you're wrong. These are not the same issues. As Patrick noted in his comments, "By chance (mainly to create SVGs for Commons) I have the fonts "Liberation Sans" and "DejaVu Serif" installed on my system." A singly user willfully choosing to download a set of fonts is not the same thing as thousands of users unknowingly having the fonts packaged with another application. If users specifically choose to download a font, like Linux Libertine for instance, and then report to us that they think it's not what they like, then the onus is on them. The case where users of LibreOffice/OpenOffice have these fonts plus having font smoothing off (intentionally or because that's their system default) is a whole different can of worms. the same thing as a report that a significant minority might have them. Please establish a number of scapegoats and guinea pigs that one has to sacrifice for Steven Walling the god of fonts to accept that something is going to go bad. AFAICS, people had anticipated that several billions of world inhabitants (those speaking non-Latin script languages) were going to be almost surely negatively affected. Maybe they should have included extraterrestrial and non-human (or even non-animal) forms of life in the count for it to be considered noteworthy? > the same thing as a report that a significant minority might have them. count for it to be considered noteworthy? We actually did release two different followup versions of the body copy settings after Patrick's comments. It was in large part due to feedback from Wikimedians like him. 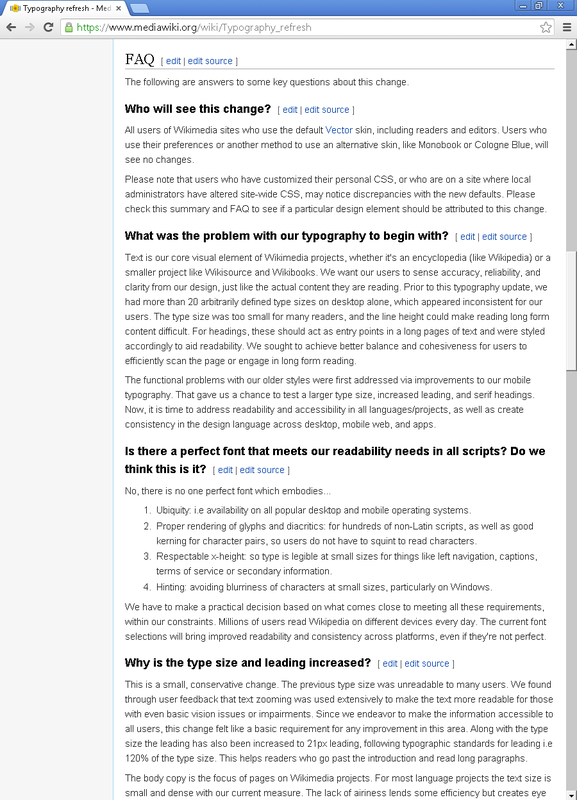 The fact that now we encountered a new issue where lots of users unintentionally get a font that does not render acceptably well is unfortunate, and we're responding as fast as we can. In the future, please explain the issue in the bug report, like bug 63591. It can be a concise explanation, but links are indirect (and sometimes require scrolling around before you get the idea) and go dead, so it's better to have something clear here. These patches are probably not very relevant to this bug, actually. Sorry.